While working in software development in general, and in web development for a couple of customers it is quite common that it is necessary to provide a test bed where the client is able to get an image, or better said, a feeling for the visions and ideas you are talking about. Usually here at IOS Indian Ocean Software Ltd. we set up a demo web site on one of our staging servers, and provide credentials to the customer to access and review our progress and work ad hoc. This gives us the highest flexibility on both sides, as the test bed is simply online and available 24/7. We can update the structure, the UI and data at any time, and the client is able to view it as it suits best for her/him. Expensive connection, ie. mobile data package, stay at a hotel, etc. Anyway, it doesn't matter really. We should be able to provide a solution for the circumstances of our customers. 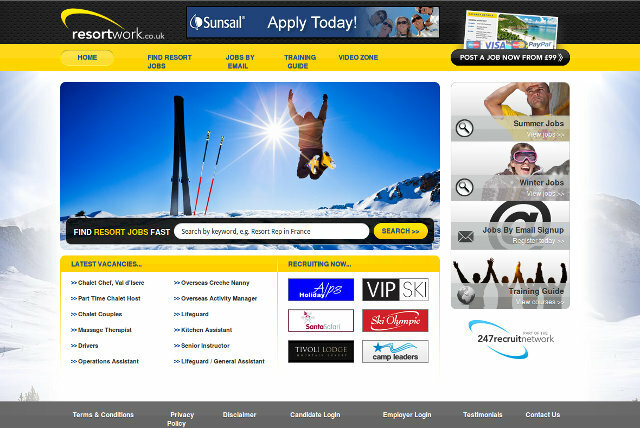 Is it possible to let us have a desktop version of ResortWork.co.uk that we can use for demo purposes at the forthcoming Ski Shows? It would allow us to let stand visitors browse the sites on an iPad to view jobs and training directory course listings. Yes, sure we can do that. Eventually, you might think why don't they simply use 3G enabled iPads for that purpose? As stated above, there might be several reasons for that - low coverage, expensive data packages, etc. Anyway, it is not a question on how to circumvent the request but to deliver a solution to that. We already did offline websites earlier, and even established complete mirrors of one or two web sites on our systems. There are actually several possibilities to handle this kind of request, and it mainly depends on the system or device where the offline site should be available on. Here, it is clearly expressed that we have to address this on an Apple iPad, well actually, I think that they'd like to use multiple devices during their exhibitions. The above mentioned web site is running on ASP.NET, IIS and SQL Server. In case that a laptop or slate runs a Windows OS, the easiest way would be to take a snapshot of the source files and database, and transfer them as local installation to those Windows machines. This approach would be fully operational on the local machine. There quite some tools in the wild that could handle this job, namely wget, httrack, web copier, etc. Simply navigate through your website and record your desktop session. Actually, we are using this kind of approach to track down difficult problems in order to see and understand exactly what the user was doing to cause an error. Of course, this list isn't complete and I'd love to get more of your ideas in the comments section below the article. It allows you to download a World Wide Web site from the Internet to a local directory, building recursively all directories, getting HTML, images, and other files from the server to your computer. HTTrack arranges the original site's relative link-structure. Simply open a page of the "mirrored" website in your browser, and you can browse the site from link to link, as if you were viewing it online. And there is an extensive documentation for all options and switches online. General recommendation is to go through the HTTrack Users Guide By Fred Cohen. It covers all the initial steps you need to get up and running. Be aware that it will take quite some time to get all the necessary resources down to your machine. Actually, for our customer we run the tool directly on their web server to avoid unnecessary traffic and bandwidth. After a couple of runs and some additional fine-tuning - explicit inclusion or exclusion of various external linked web sites - we finally had a more or less complete offline version available. A very handsome feature of HTTrack is the error/warning log after completing the download. It contains some detailed information about errors that appeared on the pages and the links within the pages that have been processed. Unfortunately, the generated output of HTTrack was still incomplete but luckily there were only images missing. Being directly on the web server we simply copied the missing images from the original source folder into our offline version. After that, we created an archive and transferred the file securely to our local workspace for further review and checks. From that point on, it wasn't necessary to get any more files from the original web server, and we could focus ourselves completely on the process of browsing and navigating through the offline version to isolate visual differences and functional problems. As said, the original web site runs on ASP.NET Web Forms and uses Postback calls for interaction like search, pagination and partly for navigation. This is the main field of improving the offline experience. Of course, same as for standard web development it is advised to test with various browsers, and strangely we discovered that the offline version looked pretty good on Firefox, Chrome and Safari, but not in Internet Explorer. A quick look at the HTML source shed some light on this, and there are conditional CSS inclusions based on the user agent. HTTrack is not acting as Internet Explorer and so we didn't have the necessary overrides for this browser. Not problematic after all in our case, but you might have to pay attention to this and get the IE-specific files explicitly. And while having a view at the source code, we also found out that HTTrack actually modifies the generated HTML output. In several occasions we discovered that <div> elements were converted into <table> constructs for no obvious reason; even nested structures. The additional question mark after the HTML extension helps to separate the query string from the actual target and solved all our missing hyperlinks very fast. The same can be done in Notepad++ on Windows, too. Just use the 'Replace in files' feature and you are settled. Especially, in combination with Regular Expressions (regex). Okay, after several runs of HTML/CSS code analysis, searching and replacing some strings in a pool of more than 4.000 files, we finally had a very good match of an offline browsing experience in Firefox and Chrome on Linux. Next, we transferred that modified set of files to a Windows 8 machine for review on Firefox, Chrome and Internet Explorer 7 to 10, and a Mac mini running Mac OS X 10.7 to check the output on Safari and again on Chrome. Besides IE, for reasons already mentioned above, the results were identical. And last but not least it was about to check web site on tablets. This article describes how you can customize the default values (10, 20 and 50) of the drop-down list in the paging element of RadGrid.